The HWBot team has spotted a very interesting entry on the SiSoft Sandra database of a quadcore eight thread Skylake CPU. The specifications appear legitimate according to the HWBot team based on Skylake engineering samples. However I’m going to tag this one as a rumor for the time being until we can verify the legitimacy of the entry itself. According to various reports Skylake will arrive sometime in the second half of next year on both the mobile and the desktop space. Skylake represents the tock in Intel’s long term tick tock cadence. A tock represents a focus on the CPU architecture while the tick represents a die shrink and a greater GPU performance improvement. So without any further delay let’s get into the contents of the leak. From the entry we can deduct that the CPU in question is a quadcore eight thread processor with a clock speed of 2.3Ghz. 2.3Ghz likely refers to the base clock speed rather than the boost clock speed. As this is an engineering sample low clock speeds are somewhat expected. Moving down the entry we can also see that this CPU has 23 graphics compute units, that’s slightly up from 20 units on desktop Haswell. However without extensive knowledge of the new GPU architecture we can’t really compare the IGP compute units of both Skylake and Haswell directly. 23 is also an odd number, suggesting that the processor might actually have some units disabled for testing purposes. The GPU score is about 30% behind the current HD 4600 graphics on desktop Haswell parts. However the score is achieved with a significantly lower clock speed (300mhz vs 1050mhz). Again we can’t really compare the two architectures in an apples to apples fashion because we simply don’t know how high Intel can clock the integrated GPU in Skylake. But if we assume that Intel can achieve similar GPU clock speeds on Skylake. Then the integrated graphics in Skylake should end up significantly faster, roughly two and half times faster. The CPU arithmetic score is actually quite good, nearly matching the i7 4810MQ which has a base clock of 2.8Ghz. 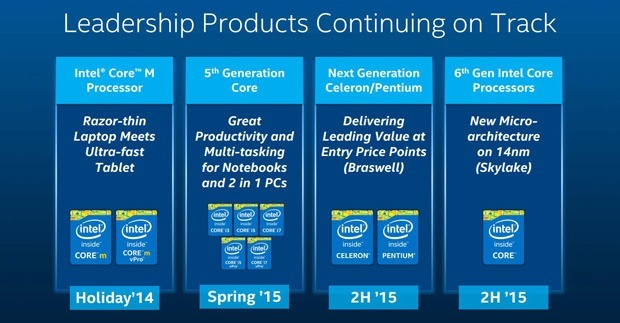 Suggesting that intel will likely introduce worthwhile IPC improvements of roughly 20% with Skylake over Haswell. It’s also worthy of note that we found several other Skylake graphics entries in the database. Some with 23CUs and some with 24CUs. However all of them shared the same 300mhz clock speed. We’re hoping to see more entries surface in the future so we can have a broader set of data to compare.